The Super 8 film making scene in the 1980s was based in a technology that had been designed as a home movie making medium for amateurs. A development of earlier 16mm and Standard 8 gauges, Super 8 was first introduced by Kodak in 1965. The gauge was supported by a number of manufacturers of film stocks, cameras, projectors and editing equipment and so, although the gauge had a number of significant technical limitations, it was available and relatively cheap. Super 8 equipment could be purchased new or acquired second hand or, as was often the case, inherited from relatives. With this aging consumer technology filmmakers could seek to emulate mainstream cinema with sophisticated and semi-professional productions utilising actors, lighting and complex post production – or they could just as easily shoot off a roll of film and screen the raw results. Annual Super 8 film festivals and semi-regular late night screenings organised by The Sydney Super 8 Film Group created a context in which filmmakers and audience members could meet, assess each others work and spur on – or brutally rebuff – the results. There were a number of influences on Super 8 filmmaking. There was the persistent influence of radical cinema of the 1960s and 70s that encompassed the traditions of avant garde modernism, the history of experimental cinema and the cultural critiques of Marxism. Students at art schools in the early 80s studied classic experimental works such as Maya Deren’s Meshes in the Afternoon , radical narrative films such as Jean Luc Godard’s Weekend  or New Realist works such as Vittorio De Sica’s Bicycle Thieves . Cinema courses and film societies at universities gave students a similarly catholic education – films ranged from European art house cinema to Guy Debord’s Society of The Spectacle , from the study of the work of Hollywood directors such as Orson Welles and Alfred Hitchcock, to the contemporary cinema of the 1980s. Since the majority of film makers were young, students, or the recently graduated, traces of these influences could be found in the huge number of Super 8 films being made and screened during the 1980s. The 1980s also saw a surge in Super 8 filmmaking as students from art schools and universities, artists and aspiring directors turned to the medium as a low cost alternative to expensive 16mm and 35mm production. Responding to this surge, late night screenings would typically screen as many as a dozen new films, while festivals would present dozens more. Informal screenings in art galleries, warehouse spaces, night clubs and other impromptu set ups – once memorably on the side of a skyscraper – gave exposure and an audience to this huge array of works. Critically assessing this groundswell was difficult. Film critics and itinerant theorists obsessed with cinematic taxonomies made valiant attempts to categorize the films. In 1987 Ross Harley attempted to create a final, once-and-for-all definition of what Super 8 film making “was”. In Fine Young Cannibals & Others, Harley stated “If anything could define Super 8 it has been its refusal to be defined or to remain within the purity of a particular historical category”. Harley then staked out four persistent styles: appropriationist, quasi documentaries, comedies and a style he called “strangely cinematic – [films] encompassing [a] history of narrative filmmaking and formalist cinematic experimentation.” Although admitting the scene’s willful refusal to be categorised, Harley had accurately described the broad tendencies of the film making scene. Using found material in filmmaking has a lineage that stretches back almost to the invention of cinema itself. Films such as Joseph Cornell’s Rose Hobart  and Charles Ridley’s Germany Calling (Lambeth Walk)  are examples, charting on the one hand a poetic, obsessive impulse in the case of Cornell’s tribute to his favourite actress, and on the other, Ridley’s politically motivated manipulation of newsreel footage that turned Hitler and his goose-stepping Nazis into objects of ridicule. These two approaches – the personal/poetic and the political/satirical – link virtually all found footage filmmaking, from these early practitioners to more recent figures such as Bruce Conner and Craig Baldwin. Meanwhile, imagery from TV screens had turned up in a number of mainstream Hollywood films such as Network , Being There , Poltergeist  and Videodrome  and these films would prove to be influential on Super 8 filmmakers. Moreover, TV imagery was part of the culture of the late 70s and early 1980s. 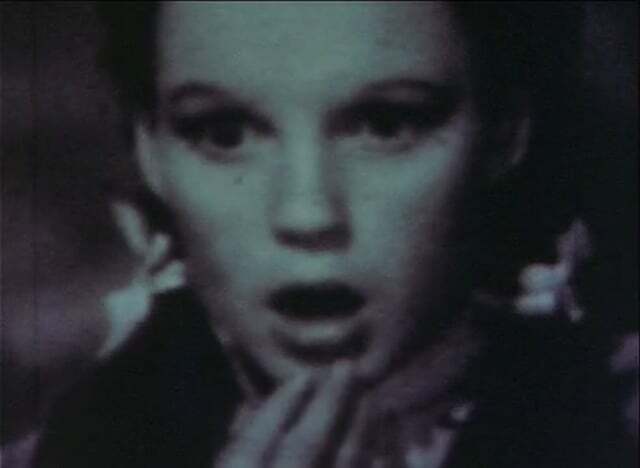 Using found footage pirated from TV screens was used in early pop music promos – notable among these being DEVO, and David Byrne and Brian Eno’s collaborations with Conner – as well as in ‘underground’ cinema of the late 70s. Sydney entrepreneur Ian Hartley’s Institute of Contemporary Events [ICE] screened Conner’s work along with pop promos and other marginal cinema while Philip Brophy [as part of the group Tsk Tsk Tsk] produced The Opening of the 1980 Moscow Olympics as Televised by HSV Channel 7 (1980), a film made up of footage refilmed from an colour-saturated TV screen. These examples of the emergence of a practice of appropriation in many cases predated the theorization of the practice itself, and can be attributed to an emerging zeitgeist of freeform appropriation and sampling using available analog technology. While there were many visual artists in the 1980s using imagery lifted from pop culture sources, Metaphysical TV stood apart because its aspirations were more poetic. Mark Titmarsh, who had coined the term in 1986, stated in his manifesto: “If you look into the void of Television long enough, it eventually winks back, the void looks into you, seeing deep desire, secret hurting, grand personal themes, doom, tragedy and ecstasy.” It might have been that many artists at the time were plundering art history and pop culture for material, but few professed the desire to become one with their subject, nor admitted that the fragmented world of television was a reflection of the artist’s soul. Titmarsh also proposed the idea that television could be regarded as an infinite number of fragments waiting to be reassembled by artist-filmmakers, guided only by their personal desires, tastes and obsessions. Stephen Harrop’s Square Bashing , for example, was a distillation of fragments from a variety of major Hollywood films – including The Hill  – a story of a British Army stockade – and Strike Me Pink , a Depression-era musical starring Ethel Merman – with a collage of soundtrack elements, multiple exposures and in-camera effects. Shot directly from a TV screen, Harrop’s film can be seen in the tradition of found footage filmmaking, yet there is something ineffably different about it. Visually it is markedly different – refilming from a TV screen enhances the dot matrix of the screen, foregrounding the ‘look’ of TV – while its soundtrack of disembodied female wails, screams and impotent commands from stern male voices, was simultaneously uncanny yet exhilarating. Square Bashing suggested a logic behind its construction, yet denied definitive interpretation, preferring instead to allow the viewer to assess its effects and ironies as they will. And it was within these ironies that Square Bashing signaled the beginnings of Metaphysical TV. Michael Hutak, one of the most prolific of the Metaphysical TV artists, used an artful irony throughout his work, allowing the gratuitous to sleep with the sublime. Writing on his film Diogenes Regret , Hutak stated “It is my hypothesis that irony has been the popular device for deconstructing opposites and hierarchies throughout the ages, that irony problematises the notion that opposites exist; and [more crucially] is the cultural mode through which Metaphysical systems can be portrayed [in the guises of fate, divine will, predestination etc.]. Diogenes Regret conflated found elements into a seemingly casual order that formed a commentary on what Hutak described as “the inexactitude of phenomena”. With images from the film Moonstruck  showing Nicolas Cage having his face slapped by Cher juxtaposed with images of Cher from the 1988 Oscars accepting her Best Actress award [“I really want to say something…”] and cut-aways to computer generated images of space, Diogenes Regret was a delirious array of bitter ironies. The film’s soundtrack, a collision of Coldcuct’s remix of Eric B & Rakim’s Paid In Full and a woman’s voice describing her “teeth grinding depression”, the film forced home the sensation that outward looking optimism – reaching for the stars – had been annihilated by a solipsistic and inwards obsession utterly devoid of meaning – yet full of so-called “stars”. Metaphysical TV films were not necessarily films that used only appropriated footage. Titmarsh had made earlier Super 8 films that combined found materials with scenes performed by a repertory company of non-actors. Exploring genre conventions in titular remakes of Night of The Living Dead  and Imitation of Life , his subsequent films such as Legion  and 35 Summers  marked out the baroque end of Metaphysical TV, with grand thematic groupings of appropriated footage and images, quotations, music fragments and acted scenes which, in Legion’s case, quoted a passion play and, in the example of 35 Summers, an extended riff on the tradition of an artist’s self portrait. Gary Warner’s films made similar use of refilmed television fragments juxtaposed with original footage. It’s A Beautiful Day Today in Berlin  incorporated sound and image lifts from the Today show, fragments of films screened on midday TV including a shot of a sign stating “You are now leaving the American Sector” juxtaposed and layered over original camera footage of building sites in Sydney, Brisbane and Melbourne. The effect of the film was a moody and uneasy documentation of cities in the process of reconstructing their spaces to conform to a new economic imperative. Both Warner and Titmarsh could effectively turn their hands to films that were entirely composed of found footage. Warner’s …of Everything  was a series of “The End” sequences from classic Hollywood films while Resistance Today  evoked the dread of the late Cold War era with visual and audio fragments of comedy, abstract static, political figures and TV advertising. Titmarsh’s This Is the Way That Jack Dies  collated scenes in which the actor Jack Pallance “died”, hyperbolically dramatic sequences that foreground the way in which the fragment – ordered by type – could serve to form a commentary on cinematic tropes. Metaphysical TV was not unique in its use of appropriated material. Filmmakers in Sydney including David Nerlich, Simon Cooper and Bernard Harte and Melbourne artists such as Ian Haig and Mark Le Rosa were making similar films, often utilising the technical approaches as Metaphysical TV. Super 8 practice in the 1980s was drawn into the theoretical debates of Post Modernism with critics and authors such as Edward Colless and Adrian Martin attempting to account for the particular effects and history of the medium and its films. I have not attempted to give an account of these debates here as they are simply too extensive to effectively summarise, but from the point of view of their effect on the filmmakers and the films they made, Metaphysical TV films were acutely aware of these debates, either as a framing device for the artist-filmmaker’s practice, or as just another reference point in a panoply of cultural markers. At the very least, Metaphysical TV films appeared to be acutely aware of their status as discursive objects, favouring a considered appreciation over visceral effects. Parallel practices of the mid-1980s such as “cut ups” drew on the traditions of Modernist art and the theoretical discourses of movements such as Situationism while English and European groups such as the UK’s Scratch Video and its exponents George Barber, the Duvet Brothers and Gorilla Tapes were using video technology to subject found material to rapid fire editing and create what were, in effect, updates on Ridley’s Germany Calling. Although Metaphysical TV shared some features with other films and art works of the time, they were also significantly different. The Super 8 scene and Metaphysical TV grew out of a particular set of influences and circumstances. When those circumstances changed, the scene slowly dissipated and fractured. Film festivals such as Trop Fest and White Gloves [and many others] attracted the more traditional narrative filmmakers while screenings organised by the Sydney Intermedia Network – the rebranded Super 8 Film Group – and later, as d-Lux Media Arts – gathered up smaller audiences for artist’s video, film and performance projects. The focus of screenings and events in the 1990s became more project and medium specific as the heady pluralism of the 80s gave way to a career-oriented decade of ‘authenticity’. During the 1990s, video post production equipment, which had always been prohibitively expensive, became cheaper and more readily available. Just as a redundant consumer technology had empowered a generation of artists and filmmakers in the 1980s, so too digital technology put the ability to make projects into the hands of a new generation. Before I discuss some works of recent video art appropriation, it would be wise to frame the recent action. The term “appropriation”, although still relevant in its literal meaning, no longer accurately describes the practice or intention. Contemporary video artists who routinely lift material from other sources often do so as a simple extension of their practice, the act of appropriation now no more special or unique than any other element of making art. In the two decades since the birth of Metaphysical TV, using found material is not a provocation; whereas audiences in the 1980s were aghast at Super 8’s provocative thefts, today’s audiences simply see it as part of the contemporary media landscape. At the same time, however, some contemporary video artist’s use of found material is framed as part of the debates surrounding ‘remix culture’, the political and philosophical campaign for the liberation of copyright. The work of Sydney artist duo Soda_Jerk can be seen in the context of this kind of knowing engagement with contemporary remix culture and with the history of appropriation. Their ambitious feature length work Pixel Pirate 2  – made in collaboration with artist Sam Smith – lifts fragments and sequences from over 200 feature films to create a narrative that is in part a comedic commentary on copyright laws and a series of ‘quotations’ of various styles of appropriation. Dawn of Remix , for example [exhibited as a separate work during the making of the larger project] lifts the Dawn of Man sequence from 2001: A Space Odyssey  and recuts it “scratch video style” to a soundtrack of LL Cool J’s Go Cut Creator Go. A chase sequence, Pixel Pirate 2: Attack of the Astro Elvis Video Clone , using fragments from Elvis movies and the movie version of Batman , similarly quotes comic strip conventions and the freewheeling sampling style of Craig Baldwin’s Tribulation 99: Alien Anomalies Under America . Perhaps Soda_Jerk’s most interesting piece in relation to Metaphysical TV is the video The Phoenix Portal , a hypnotically poetic narrative that edits together two films featuring the late actor River Phoenix. In the video, Phoenix’s younger self – the child actor who appeared in Explorers  – has invented a time portal through which an older version of himself – as he appeared in My Own Private Idaho  – is brought “back” to the present . Unfortunately, his sudden appearance inside a tiny blue bubble causes chaos while the dislocation connects the narrative of narcolepsy from My Own Private Idaho to a commentary on death. With a sampling of the dreamy slide guitar soundtrack from My Own Private Idaho and shots of fly-overs of wheat fields, The Phoenix Portal reads like an update on Metaphysical TV and its aspirations of poetic ironies and physical integration with the subject. Emil Goh, a photographer and video maker, has over the last several years produced Remake, a series of gallery installations that use three screens to simultaneously project complete, unedited and unaltered feature films, side by side as video triptychs. One version screened in Sydney at Artspace in 2003 used three versions of La Femme Nikita (1990); the original in the middle screen, the American remake The Assassin (1993) on the left and on the right, Black Cat (1991) a Korean version. The work made more sense as an act of appropriation than one of ‘remix’, eschewing the dramatic frisson of the visceral effect for a more considered contemplative experience – only through the duration of the piece did the work suggest a possible interpretation for its own making. Another artist working in a style with conceptual connections to Metaphysical TV is Melbourne video maker Brendan Lee. By examining the language of cinema, Lee constructs pieces that replay persistent tropes as dramatic as gunfights [Shootin’ from the Hip 2004], or as subtle as a look or a gesture [Out of The Blue, 2004]. In his work Plain Old Video , Lee took a series of shots from a film in which a passenger aircraft crashed, or more precisely, was continually in a state of crashing. As fire balls rip through the cabin, as wings are torn off and people are sucked out of the aircraft, the video continues, ramping up the destruction without a payoff. Intentionally or not, Lee’s work echoes those of Warner and Titmarsh and their taxonomies of tropic effects. There are many more examples of recent video work with a direct line back to Metaphysical TV and the works of the early found film pioneers. Using available video technology, artists such as Stephen Fox in his piece The Birds , can take footage from Hollywood films such as Hitchcock’s The Birds  and remove the nominative subjects of the original film, or collage found elements together into psychedelic Mandalas such as Tara Marynowsky’s The Apple of My Eye . What remains consistent among these works is their penchant for treating television as a world that can be cherished, explored and plundered. A term coined by Michael Hutak to define the era of Super Eight in the 1980s. The group was: Mark Titmarsh, Gary Warner, Michael Hutak, Stephen Harrop and Andrew Frost. Ross Harley, Fine Young Cannibals & Others, Filmnews, April 1987. Mark Titmarsh, Metaphysical TV, or how to make film with the hammer, 1987. Catalogue notes, Metaphysical TV, 1988. See Super 8: The Phenomena Turned Eventful, Ted Colless, On The Beach, No.1, 1983. See particularly Something Close To Nothing: Appropriation in Australian Experimental Film & Video of the 1980s, Adrian Martin in What Is Appropriation? Rex Butler, ed., Institute of Modern Art, 2004. Second Ed. Dolphins: From Metaphysical TV to Remix Culture, published as part of the SynCity program at the Australian Centre for Photography in 2006.